My acquaintance with urban farming started at a vegetable gardening course offered for free. The course involved companion planting on a wasteland in Amsterdam Noord, carefully designed and prepared by social entrepreneur Martijn Schreuder. A book dating from 1980, titled Companion Planting: Successful Gardening the Organic Way, written (in German) by gardener Gertrud Franck served as our textbook. Companion planting is fairly well known among vegetable gardeners, but to get a grasp of the intricacies of designing a year-round vegetable garden Franck’s book has quite something to teach. 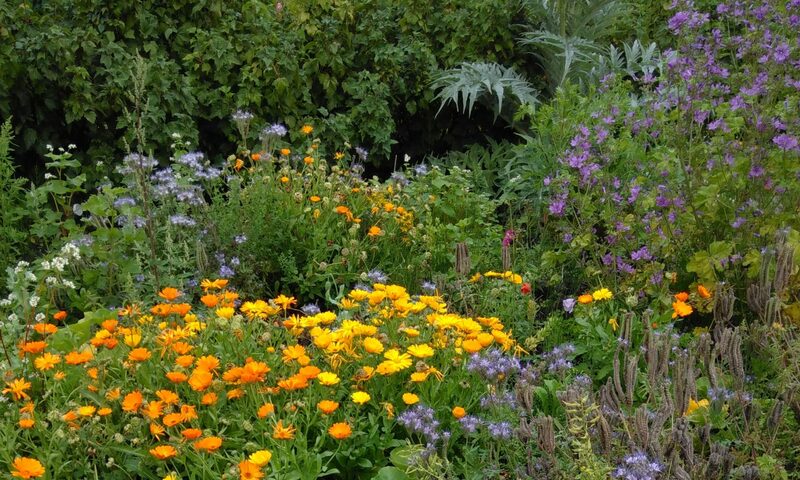 While still a novice in companion planting, even more when it comes to perennial plants, the underlying principles of sustaining diversity, playing with companionship and avoiding bad chemistry are not hard to grasp. While our harvests were modest, partly thanks to the numerous slugs, the afternoons we spent sowing, watching, weeding and talking proved invaluable. I often got distracted (or enlisted, as Bruno Latour might say) by the beautiful, sturdy wild carrot plants springing up everywhere and I marvelled at the constant swirling of bumblebees on the flowering phacelia. We discussed life, love and politics, shared soup and sandwiches, while watching dragonflies, frogs and an odd hare: more companions on the wasteland. Perhaps the most important purpose served by the garden and our freely chosen activities there was a building a spirit of resilience. I am aware that resilience is a container notion often used to depoliticize action in the context of a changing climate and an uncertain economic future. But I stumbled on a book which by and large surpasses this criticism and which resonates with the afternoons spent on the communal wasteland/garden. It conveys what it may mean to build a spirit of resilience, as a 21st Century sequel to a 20th Century spirit of resistance. Petit traité de résilience locale by Agnes Sinaï, Raphaël Stevens, Hugo Carton and Pablo Sevigne is something of a mixture between a scholarly and activist treatise on resilience. The authors delve into the scientific meanings of resilience and invoke spiderwebs, chameleons, roses, antcolonies, butterflies and coelacanths to explain the multiplicity of its meaning, but they also discuss politics and power. As with many positive notions, the crucial question to ask about resilience is: “what kind of resilience do we want, whereto and for whom?” Certainly not resilience “as used by those (Davos Forum) who want to strengthen the financial structures which favour the rich and which are among the causes of collapse” (p. 33). Instead, the authors envisage ‘communal resilience’, based on mutual aid, solidarity and kindness towards strangers. This hardly sounds radical, and neither do the three axes of their politics of resilience. Until one realises that it concerns a deep re-localization of power. The first axis of the politics of resilience is about re-localizing work. It involves the creation of local, low-tech employment that cannot be outsourced, such as permaculture and artisanship. One realizes that it could be a radical turn as the authors foresee agriculture to become one of the major sectors of employment. To note: it concerns fossil-free organic agriculture and permaculture, both labour-intensive. It also involves thermal solar power instead of photovoltaic, the latter power being of questionable sustainability. Local healthcare, woodstoves, low-tech printing, short-wave radio, computer-free tools for arithmetics (such as the abacus) are also part of the resilience toolbox. Those who worked on alternative life-styles in the 1970s will not be surprised, though it may seem radical in the current age to do away with the computer. From a resilience point of view, however, preparing for a breakdown of the digital makes sense. The second axis involves enhancing the resilience of cities in the face of climate change. Local governments have come to realize that reducing carbon emissions and measures to adapt to a changing climate can be economically advantageous. All this guarantees little in terms of resilience in the wake of disasters, and spontaneous aid within and across neighbourhood communities remains indispensable. And in many parts of the world, the price of petrol remains an inflammable for social conflicts. Rationing petrol and electricity while redesigning infrastructures and urban space would be a prudent two-pronged approach to enhance resilience, the authors argue. Here the intervention of authorities, based on political choices, is clearly indispensable. The authors do not dwell on how to build and mobilise democratic political will on these matters. Will it emerge by necessity? The third axis sounds like complex engineering. It involves “conceiving infrastructures according to the principles of redundancy, modularity and adaptability for different scales and uses” (p. 41). It does not become entirely clear what the authors mean by all this, the concept of modularity for instance is mentioned only once and nowhere explained. When discussing local resilience, their main concern is territory, and the activities employed on ‘a territory’. Inspired by ecological and permaculture thinking, they propose that “each element of a territory fulfills multiple functions and each function is supported by multiple elements, like in nature where multifunctionality is the norm” (p. 65). This may all sound rather technical, it does involve a turn away from modernist thinking, where functional differentiation is the norm. It also reminds me of a feeling of joyous creativity when, for instance in the garden, one has to make do with what is available. Materials can be used for purposes hitherto unimagined. In the garden, both innovation and art are not far away if you allow yourself. Perhaps the principle of redundancy also includes room for the ‘non-functional’. The most radical proposal, and also the most difficult one to imagine, concerns the status of territory. “Territory becomes the central actor in the (sustainable) production of wealth and the economy (based on solidarity), by leaving the relationship between culture and nature to the responsible self-management of local communities. Territory is considered a common good” (p. 67). This proposal would deserve a treatise in itself, in fact, the authors refer to such a treatise. The literature on commons thinking is vast and fast growing, and I have read very little of it, so I will not comment on this point. But to me it seems indispensable to start thinking the commons and experimenting with it, even while the reality of land grabbing and concentration of resources make it a far away reality in most places. The spirit of resilience is like that, it feeds on ‘active hope’, Sinaï, Stevens, Carton and Sevigne assert. Learning about companion planting is part of it, too. An important source of inspiration for me to start exploring urban farming and permaculture was the documentary Tomorrow / Demain, which seems to have inspired many like me. I found a copy of the English version Companion Planting. Successful Gardening the Organic Way. Wellingborough, Northamptonshire: Thorsons Publishers Limited, 1983.